For the College Division, early Fall is probably the most exciting time of year. While it can’t compare to the intensity of the Series or even the regular season, it has its own positives. Stepping out onto the field for the first practice and seeing double or even triple the usual number of people can bring a smile to even the most hardened veteran. As college captains across North America are attempting to sort through just what they have on their hands this year, here we will discuss what to expect from some of the known quantities among incoming freshmen. By compiling all the graduating seniors’ college destinations from last year’s High School Regional and Youth Club events, we can get a sense of who is going where and how that will shake up the college game. So without further ado, here are the top ten rookie classes for the 2015-16 college season! Tied for one of the smallest rookie classes in the country (with a grand total of one) is Bates College. But it’s a big one. The DIII school gains Josie Gillett, the assist leader for Seattlesaurus at this summer’s Youth Club Championships. While stats aren’t everything, the fact that Gillett was able to assist on more throws than two U-19 teammates should clue people into her talent. As far as talent goes, Gillett by herself is able to prop Bates up into the top classes in the country. The defending national champions feature a mostly local grouping. Three out of their four recruits come from the state of Oregon. Their two YCC players were Maya Otsuki and Joanna Lyle, from Colorado Cutthroat and Oregon Glory, respectively. Otsuki didn’t have a massive statistical impact in Blaine, but comes from a fantastic ultimate scene in Denver. Lyle mainly scored goals for Glory but has plenty of experience from playing against some of the top Northwest players in the country. Like Washington (#7 on this list), UBC is able to field a strong class based entirely on home grown talent. Both Julia Zhang and Paige Muir played for the British Columbia U19 All Star team that took gold at the Canadian Youth Championships this summer. Both did sizable amounts of damage on both sides of the disc. Laura Worsley, who also played on that team, is going to British Columbia as well, but as a recruit for volleyball, it is unlikely she will play ultimate. The Washington area girls’ ultimate scene offers three of their own to Element this year. Mandy Truong and Sophie Johansen were solid players on the Seattlesaurus team that took first place at YCCs this summer. Their lack of statistical impact could be a result of playing with such a star-studded lineup. In fact the Washington class has a running theme of being more talented than they appear. While Truong, Johansen, and Cleveland high school player Linda Chen are lacking in name recognition, they are far from lacking in talent. The star of the Lysistrata’s Tools rookie class has to be Frances Gellert. The former U-19 Worlds and Seattlesaurus player is one of the top players coming out of high school this year. She is joined by Colorado Cutthroat player Marlee Akerson. Akerson led Cutthroat in goals and Ds this summer, while also adding 11 assists. Finally all the way from the East Coast, Lexington player Elle Clayton rounds out the wonderful Lysistrata’s Tools rookie class. Superfly snags the second best recruit in this year’s class: Seattle Underground player Hallie Dunham. While that would probably be enough to get them into the top ten, the talent joining Dunham only makes this class more potent. Carly Eckstrom from Minnesota was a solid contributor for Superior at YCCs; she lead the team in Ds and added four assists. They are joined by HB-Woodlawn player Amanda Hayes. NC State has both quality and quantity in their rookie class. They have the second largest class of any team on this list, all from the state of North Carolina. Katie Cubrilovic and Danielle Sawyer highlight the incoming recruits. Together, the pair totaled 12 goals and 34 assists at YCC. Outside of them, Jaga Monsta has plenty of other potential impact players. Mary Clark Worthington played with Cubrilovic and Sawyer on the YCC Warhawks this summer. Carrie Ho and Jackie Hausle, the final two members of this class, are probably very familiar with the rest of their rookie teammates after facing off against them in various games during their high school careers. While the elite level talent of Hallie Dunham and Jaclyn Verzuh is well documented, Brittney Kokinos has been improving her craft in relative obscurity. The Madison Heist player is transferring to the University of Wisconsin and will provide a large lift to Bella Donna. Carly Siewert was a first team All State selection for the state of Minnesota and played for Minnesota Superior during YCC season. Kokinos’ teammate Jackie Welsch is also with her on this year’s Wisconsin rookie class. Finally, Lexi Amundson from Memorial rounds out the group of regional talents. Minnesota will absorb the largest number of recruits overall and the most playing youth club this summer. While Minnesota finished 10th, they gained high level experience that they now take with them to the Twin Cities. Ellie Sjordal, Lindsay Hoeppner, and Dina Carpenter-Graffy are all strong regional talents that will make immediate contributions. This class consists of four All State selections, three from the state of Minnesota (Cowan, Kostecki, and Blanek) and one from Wisconsin (Carpenter-Graffy). All of this results in a team that top-to-bottom has proven their excellence at the highest level of their area’s ultimate scene for their age group. Princess Layout will have a spotlight on them this season and the next few years as a result of incoming freshman Jaclyn Verzuh. Verzuh has shot to prominence after playing for the U-23 and All Star Ultimate Tour teams followed by an outstanding rookie season with Seattle Riot. 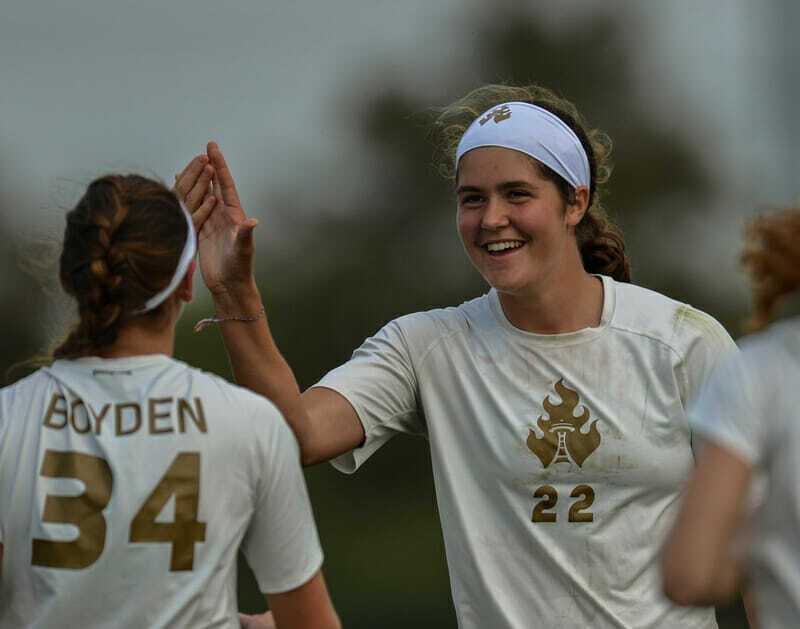 She is no doubt the number one recruit in the Women’s Division this year and is probably the most talented rookie to come into college ultimate in at least a decade. Besides Verzuh, Dartmouth gets a few more players who can contribute to their success. The most well known of those is Caitlyn Lee. Lee has been a Colorado All State player since her freshmen year in high school and was a U19 Worlds tryout invitee. Add to those two Emily Hyde, Katie Radoloucki, and Ellen Pattison, who come from Summit, Paideia (JV), and Roosevelt, respectively. While the demands of high school will be nothing compared to college, you can count these five to be among the most prepared out of this year’s rookie classes. Georgia: Dawgma has two new players from their own backyard come into the program. Sally Cummings is a Youth All-State selection who played for cATLanta this summer. Madison Smith played for the undefeated Paideia last season. Colorado: Similar to Dawgma, Colorado Kali picks up two solid players who have made noise at the high school level. Zoe Rath played for Neuqua Valley, while Madison Green played for Memorial, both of whom were All State selections for their past seasons. If you’re wondering where this list is coming from, the full length list (with the destinations of all graduating high school seniors) can be found here. As far as Nationals contenders who didn’t get talent from any of the Regionals level high schools or YCC teams, Middlebury has the most unique situation. Three of the five teams in their section received at least one player with prevous ultimate experience. Every team that finished in the top four at New England Regionals last year (besides Middlebury) also received a player. While one player (a rookie at that) will not change the outcome of a season, it’s interesting to see if this will affect Middlebury’s placement in anyway. The largest percentage of players featured on this list went to the Atlantic Coast region. From a rookie class perspective, UVA Hydra is joined by NC State, George Washington, and Georgetown as having the best classes overall in the region. Whether this could result in a second bid for the region in the coming years remains to be seen. The Northwest region remains the best when it comes to incoming players. With three teams on this list and several more (Western Washington, Whitman) featuring strong classes, it would be surprising to see this region lose its grip on the college division in the coming years. Additional research and analysis provided by Scott Dunham and Keith Raynor. Xavier Stewart is a freshmen at Towson University studying English. He played for four years Baltimore Polytechnic high school and currently play's for Towson's B-team, Bamboozled. He can be found on Twitter @yescoolwow. Comments on "The Top 10 Freshman Classes In The College Women’s Division"